This EP this a fine piece of acoustic fiddle work lead by Laura Cortese. She has assembled a four-piece string group (consisting of all females) to help her out. There are two other fiddles (Brittany Haas on 5-String and Hanneke Cassel) and a Cello (Natalie Haas). What I think worked best was the sampling of styles. This isn't a classical, folk, pop, or celtic string album, but rather a combination of all of those. Taking bits and pieces works better to show off their playing then focusing on one genre. What I think could work even better would be fusing those styles into individual songs rather then playing one style on song then showing off another somewhere else, which is what really occurs here. 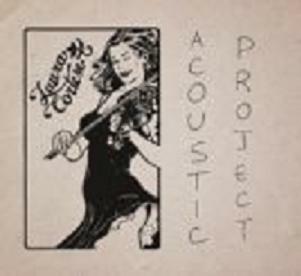 If you are into acoustic tunes, especially fiddle playing give Acoustic Project a whirl.